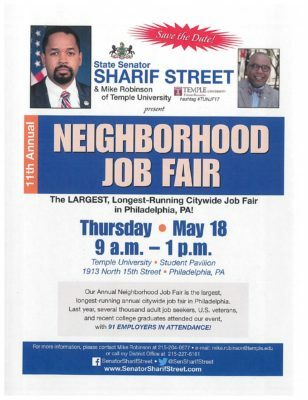 PHILADELPHIA, May 15, 2017 — State Sen. Sharif Street and Michael Robinson of Temple University are hosting the 11th annual Neighborhood Job Fair on Thursday, May 18 from 9 a.m. to 1 p.m. at Temple University’s Student Pavilion, 1913 N. 15th St. in Philadelphia. The event is the largest, longest-running annual citywide job fair in Philadelphia. A hundred employers will be available to meet with recent college graduates, adult job seekers and veterans. Computers will be available, giving constituents the chance to begin the application process on site. For more information, call the senator’s district office at 215-227-6161 or call Mike Robinson at 215-204-0677.